We love our four-legged friends, but bringing them in the car can be a real hassle. If you are someone who loves to take Fido everywhere you go but doesn’t love the mess that is left after they jump out of the car, we understand your pain. 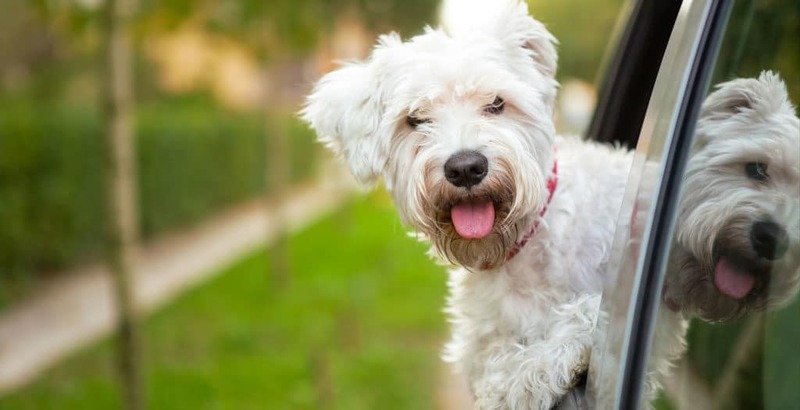 To combat the hair and debris, take a look at these helpful tips and tricks on how to protect your vehicle from dog dander. Buy a Car Hammock – This is defense number one! A car hammock attaches to the back headrests of your front seats and the front of the second row to create a U-shaped barrier that perfectly fits your pooch. Not only does the car hammock catch all the hair that falls, but it also gives your dog a more secure seating area. Most car hammocks also come with slits for seatbelts so you can buckle your pup in. Use a T-Shirt – If you have a nervous shedder, a car hammock will have trouble catching all the floating hairs. You can remedy this by grabbing a used t-shirt and dressing your dog with it. Simply gather up any extra part of the shirt and secure it with a rubber band. This will trap some of the extra hairs that otherwise would be scattered throughout the cabin. Clean Immediately After Use – Once your dog has left the vehicle, it’s important to immediately clean the area to get any loose hair or debris. The longer hair sits on top of your exterior, the easier it can get embedded into the fibers, making it more difficult to clean later. Crate Your Dog – If all else fails, crate your dog in the cargo area or backseat. Just make sure you put a blanket down under the crate to catch any extra hair. Want more helpful tips and tricks like these? Then check back with our blog here at Liberty Bay Auto Center!